Great news! 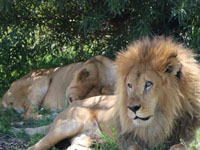 The 27 lions Animal Defenders International (ADI) rescued from circuses in Peru and Colombia are now at the ADI Wildlife Sanctuary in South Africa and thoroughly enjoying their new environment, exploring, sunbathing, snoozing. The move was overseen by the lions’ veterinarian, Dr Peter Caldwell, and they all traveled well without ill effect. Ricardo, Easy, Shakira, David, Leo, Muñeca, Africa, KiaraH, Rolex, Chino, Coco, Zeus, JuniorC, Bumba, Bolillo, Ojiclaro (OJ), Iron, ReyC, Smith, KiaraC, Amazonas, Mahla, Scarc, JuniorH, King, ReyA, and Simba were all rescued during ADI’s extremely difficult two-year rescue mission in Peru and Colombia, as we closed down their animal circuses. After serious problems at the sanctuary where they were, including the deaths of six lions, ADI decided that it was in the best interests of the health and welfare of our rescued animals that they be removed. Last November, the South African High Court ordered that the 27 surviving lions be handed back to ADI. Our precious lions are back in the heart of the ADI family, with the people who saved them from those horrific circus cages in South America. Building our new sanctuary has been tremendously hard work and a strain on our finances, but we all knew this was the right thing to do. It was simply magical to see our efforts burst into life when the Spirit of Freedom lions took up residence. Leo, now over 16 years old, has a particular place in our hearts. He had been fading fast when we rescued him from the circus, but was nursed back to health by the ADI veterinary team and became one of the most playful lions at our temporary rescue center. In his new forever home at the ADI Wildlife Sanctuary, Leo headed straight out into his habitat and climbed up onto a platform and surveyed his new land. When the love of his life, Muñeca, came to join him, they went exploring together, finally settling in the shade of a lovely tree. ReyC, father of the Cusco pride, bounded from his travel crate like a youngster, running over 100 yards to nuzzle his brother, Smith, who had already been exploring their new territory. One after another, the 27 lions took possession of their new home. Our priority has always been the safety and welfare of these animals, and for this reason we continued to pay for their food, security, and veterinary care where they were right up until the move to the ADI Wildlife Sanctuary. This means that as we built our sanctuary, the monthly charges for their security and care have risen to around $20,000 per month. ADI’s total expenditure at the sanctuary where we had taken them over two years ago has reached around $800,000. As yet, the other sanctuary has refused to return anything purchased by ADI there for our rescued lions. Now is the time to celebrate a new beginning, not only for our 27 lions from Peru and Colombia, but all the animals we can save in the future, who will have a secure and peaceful home at the ADI Wildlife Sanctuary. A place where all our rescued residents will be treated with loving kindness, respect, and care. Their happiness and welfare will be the number one priority for us. I dearly hope that you will help us to care for these lions and give them the life they deserve, as we also prepare our sanctuary to receive 6 new lion residents and 12 tigers from our circus rescue in Guatemala. Please donate here to care for the 27 ex-circus lions who have just arrived at their forever home (give today and your donation will be doubled!). Thank you to everyone who has stood by us during this difficult period. As always at ADI, the welfare and protection of the animals come first, so thank you for being with us on this journey.